Mari and I attended a Summer Solstice celebration at the Unity Church of Sarasota. 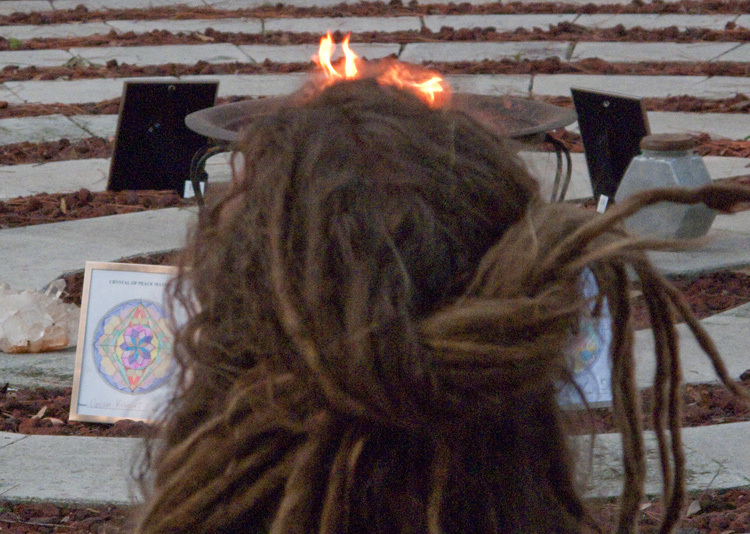 It was held outside in the Unity Labyrinth. We have been told that Sarasota is one of 22 Crystal Cities of Light in the world. Here is a link to Jo Mooy article Prism of Light and Crystal City of Light. The sound file you are hearing (if you have your sound on) was played and sung during the Solstice celebration and also sung around the world on the Solstice: The One Song Project. The chant is “OMA, KA, OM” pronounced “OM-AH, KA,OM”. And Mari says: This was a wonderful way to celebrate the height of the Summer season! I especially liked that the ceremony seemed derived from diverse spiritual traditions, and also that we were linked to people all over the world through the chant. The evening made me feel warm and fuzzy all over – and it wasn’t just the heat & humidity!